After a long history of neglecting children with special needs, Congress enacted the Individuals with Disabilities Education Act (IDEA) to grant every child with a qualifying disability the right to a free and appropriate public education. To ensure local compliance, the IDEA created a private right of action through which parents may sue their school district for failing to offer an adequate education for their child. If successful, these parents, may then send their child to a private school at the expense of their local government. Private enforcement of the IDEA has helped equalize educational opportunities for wealthy children whose parents can afford to commit to the financial, emotional, and physical costs of suing the government, but children of less affluent families who cannot afford to make similar commitments are often left behind when a school district fails to adhere to the IDEA’s mandate. As a result, large special educational disparities exist in segregated school districts between wealthy, predominantly white families and less affluent, predominantly non-white families. State and local governments have mostly limited their efforts to fully achieve the IDEA’s goal by implementing voucher programs, which allow only a handful of low-incomechildren to enjoy the educational opportunities afforded to their wealthier peers. Under Mayor Bill De Blasio, New York City took a different approach and began settling most IDEA claims to effectively lower the procedural barrier for parents. Much like vouchers, however, De Blasio’s policy fails to address the underlying issue: The IDEA’s reliance on private enforcement will continue to fail those who historically have been deliberately excluded from the full social and economic benefits of white citizenship. State and local governments must go beyond tinkering with the accessibility of the private enforcement mechanism and instead invest financial resources to equalize educational opportunity through public enforcement of the IDEA. 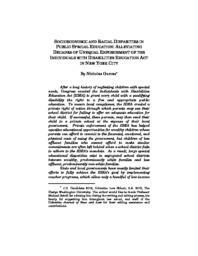 This Note assesses potential state and local policy reforms to secure expanded special education opportunity and discusses how New York City can begin to effectively lead in IDEA public enforcement.